"Even in my sleep-deprived state, I've managed to pull off another one of my classic pranks. Bazinga!" Exclusive Sheldon Cooper wearing a Shazam! T-shirt. Entertainment Earth Exclusive! This authentically rendered Bif Bang Pow! 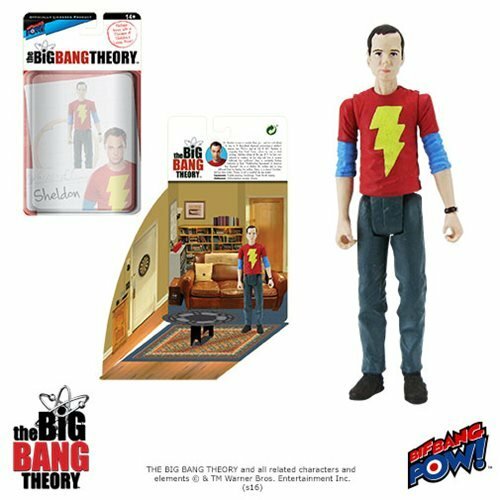 3 3/4-inch scale action figure of Sheldon Cooper from The Big Bang Theory presents the physicist wearing a vibrant red shirt with the distinctive yellow Shazam! lightning bolt. The rest of Sheldon's outfit is complimented by his infamous long-sleeve undershirt, gray slacks and dark brown shoes. The apparel is inspired by Sheldon's wardrobe from an actual episode!